US stocks extended losses on Wednesday as investors digested a batch of generally downbeat economic reports. 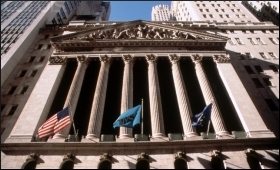 The Dow Jones Industrial Average decreased 248.91 points, or 1.00 per cent, to 24,758.12. The S&P 500 lost 15.83 points, or 0.57 per cent, to 2,749.48, Xinhua news agency reported. The Nasdaq Composite Index was down 14.2 points, or 0.19 per cent, to 7,496.81. Advance estimates of US retail and food services sales for February 2018 came in at $492 billion, a decrease of 0.1 per cent from the previous month, missing market consensus of a 0.4-per cent gain, the Commerce Department said on Wednesday. "Retail sales continue to disappoint, especially the biggest ticket auto and furniture components. GDP estimates will be revised down again. With consumption now tracking 1.8 per cent, look for the Atlanta Fed to revise from 2.5 per cent to 2.2 per cent," said Chris Low, chief economist at FTN Financial, in a note. In a separate report, the department said that manufacturers' and trade inventories were estimated at $1,917 billion in January, up 0.6 per cent from the December reading. Meanwhile, the Producer Price Index for final demand advanced 0.2 per cent in February, seasonally adjusted, in line with market estimates, the US Labor Department reported. On an unadjusted basis, the final demand index increased 2.8 per cent for the 12 months ended in February. Investors also kept a close eye on the White House, after President Donald Trump fired Secretary of State Rex Tillerson and replaced him by Central Intelligence Agency Director Mike Pompeo.